Following his victory at the Tribunal, the Senator representing Osun-west senatorial district, Dr Ademola Adeleke, Friday joined his party members to congratulate himself, saying to God be the glory. 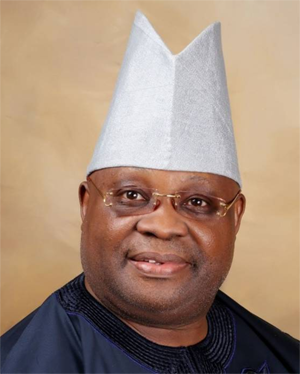 Recall that the Osun State governorship Election Petition Tribunal sitting in Abuja, declared Adeleke, candidate of the Peoples Democratic Party, PDP, winner of the September 2018 gubernatorial election in the state. Adeleke’s petition which challenged the victory of the All Progressives Congress (APC) and Governor Gboyega Oyetola governorship election, saw his victory today. However, as PDP, Ede people and some Nigerians jubilate for his victory, the dancing senator, who promised to dance for his people if he wins the election in 2018, said via his tweeter handle; “To God be the glory”.